AWS Cost Explorer has an easy-to-use interface that lets you visualize, understand, and manage your AWS costs and usage over time. Get started quickly by creating custom reports (including charts and tabular data) that analyze cost and usage data, both at a high level (e.g., total costs and usage across all accounts) and for highly-specific requests (e.g., m2.2xlarge costs within account Y that are tagged “project: secretProject”). Using AWS Cost Explorer, you can dive deeper into your cost and usage data to identify trends, pinpoint cost drivers, and detect anomalies. A set of default reports are included to help you quickly gain insight into your cost drivers and usage trends. Set a custom time period, and determine whether you would like to view your data at a monthly or daily level of granularity. Dig deeper into your data by taking advantage of filtering and grouping functionality, using a variety of available dimensions. Use forecasting to get a better idea of your what your costs and usage may look like in the future, so that you can plan ahead. Once you arrive at a helpful view, save your progress as a new report that you can refer back to in the future. Directly access the interactive, ad-hoc analytics engine that powers AWS Cost Explorer. AWS Cost Explorer includes a default report that helps you visualize the costs and usage associated with your top five cost-accruing AWS services, and gives you a detailed breakdown on all services in the table view. The reports let you adjust the time range to view historical data going back up to twelve months to gain an understanding of your cost trends. 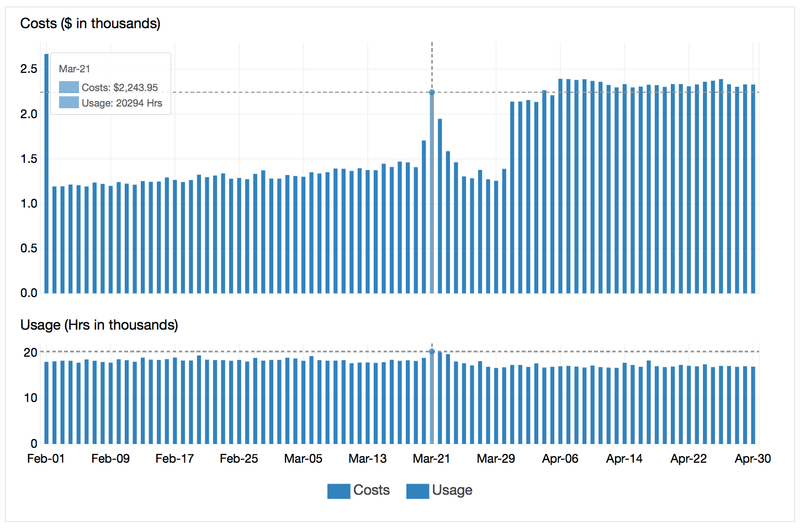 The EC2 Monthly Cost and Usage report gives you the ability to view all of your AWS costs over the past two months, as well as your current month-to-date costs. From there, you can dive deeper into the costs and usage associated with particular linked accounts, regions, tags, and more. The Monthly Costs by Linked Account report lets you view the distribution of costs across your organization. To recreate this chart for your linked accounts, all you have to do is add "Linked Account" as the grouping dimension in Cost Explorer. The Monthly Running Costs report gives you an overview of all of your running costs over the past three months, and provides forecasted numbers for the coming month with a corresponding confidence interval. This report gives you good insight into how your costs are trending, and helps you plan ahead. To learn more about the RI Utilization and Coverage reports, please reference the RI Reports page.